On the carpet it’s a bold lip and designer dresses. Off the carpet it’s still designer, probably, but much more casual. Coveralls. She looks so cute in coveralls. 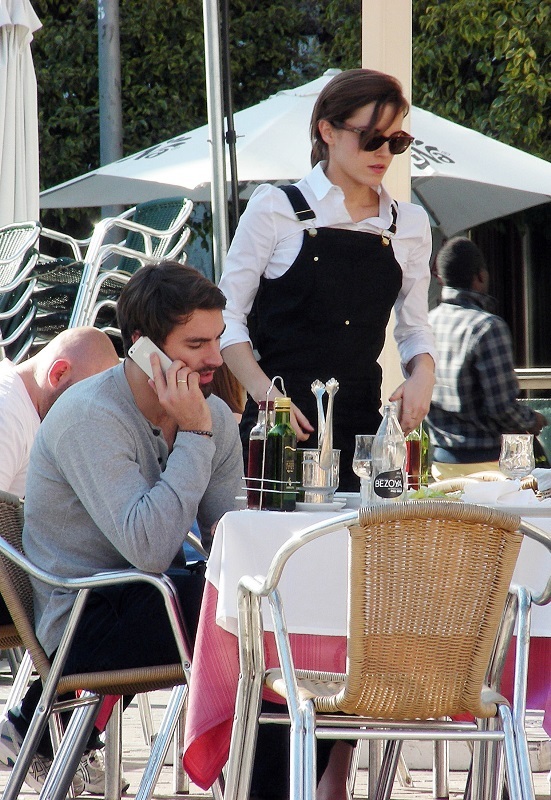 These photos were taken the other day in Madrid as Emma Watson was having lunch with her new boyfriend Matthew Janney. He’s a rugby player. So it means that he’s joined her on at least part of her press tour for Noah. Why not travel across Europe at the same time? I always wonder though – who pays for that? Like, the studio for sure is covering her flights and hotels. So does she cover his flight? Or is it in her contract that the studio gives her a plus 1 or a 2 on top of hair and makeup and styling for travel? Studios are tight-asses normally. Also attached - Emma arriving at LAX last night.